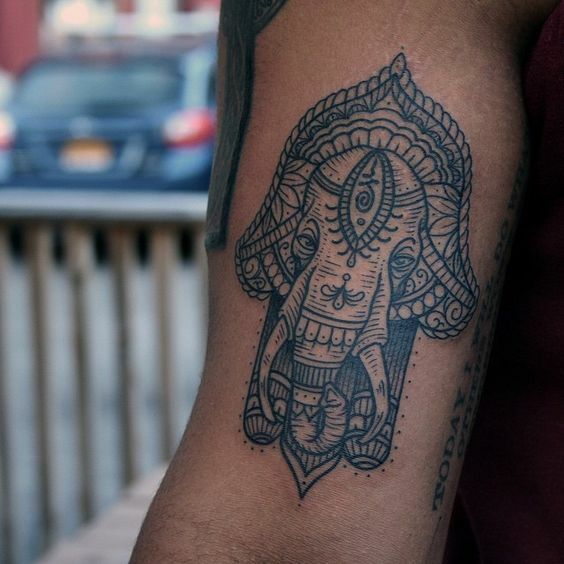 A type of tattoo has been taking the world of tattoos by storm lately known as Hamsa tattoos. 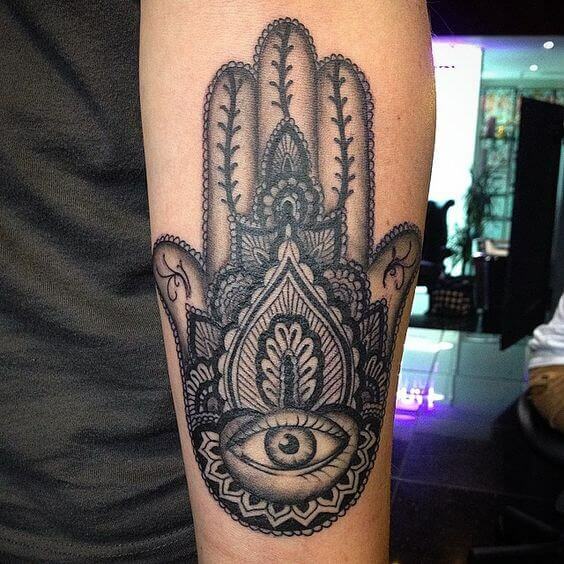 Today we will look at what exactly Hamsa tattoos for men are and what makes it so appealing. Hamsa is an Arabic word which is used to refer to an amulet that looks like an open palm. It is very popular in Middle-eastern culture and is used as a symbol of protection and defense against dark forces. It is highly pleasing to look at from an aesthetic point of view. Characterized by typical elements of Middle-eastern artforms such as highly intricate patterns, closely flowing lines give the design an air of majesty and uniqueness. 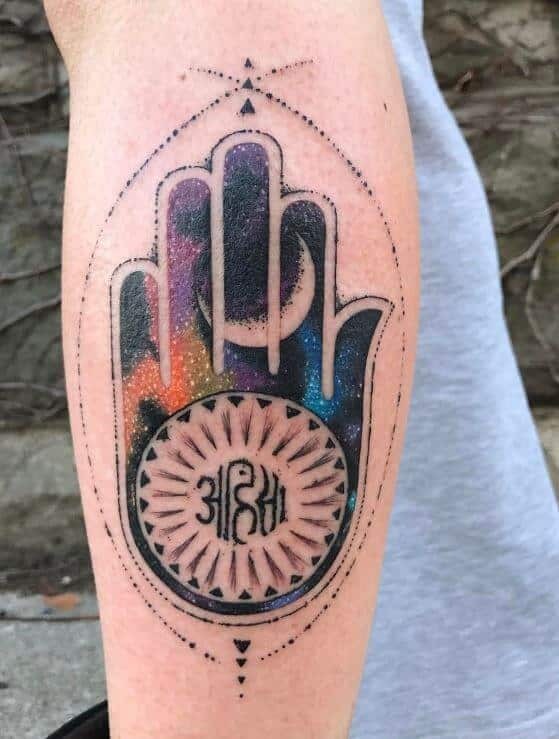 This is a sacred symbol for people from various modern religions such as Jews, Christians, and Muslims and that makes the tattoos inspired by this design even more meaningful. The basic outline is that of an open right hand. The right hand represents the positive part of life and that is the basic message behind this tattoo. Inside this outline, a highly complex pattern work is used that requires a lot of skill and a steady hand to reproduce in a tattoo. The design rarely uses sharp lines and instead relies upon free-flowing highly curving lines that still have symmetry to them. They pack in as many details as possible without appearing chaotic. Every single line and design element has a purpose and meaning behind it. All this in the form of a tattoo makes it the perfect option for anyone looking for a tattoo that is compact, complicated and culturally significant with a rich legacy that goes back for centuries. The right hand is almost universally accepted as a symbol of everything that is good. 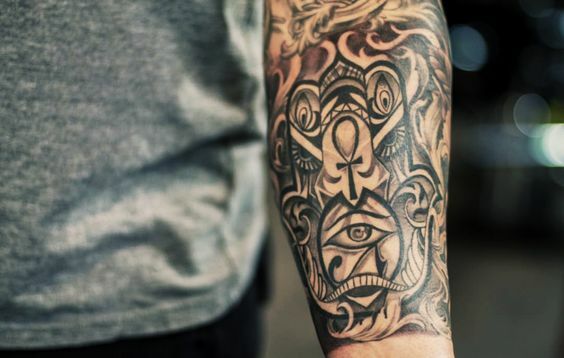 Hamsa tattoos for men build on this concept and represent the triumph of good over evil. 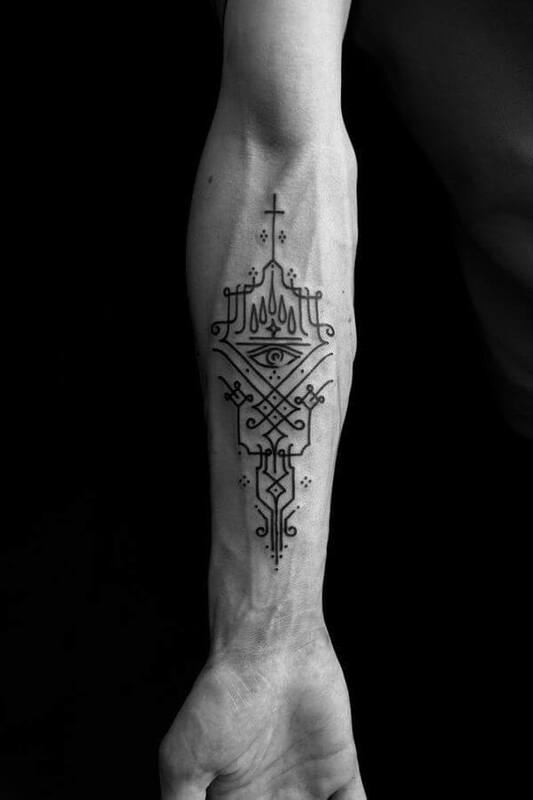 The design elements in this tattoo act as a charm against negative forces and energies. They also are believed to be a source of prosperity, protection, and blessings. Culturally this was a design used extensively in jewelry and wall-hangings, perceived to ward off the evil eye which was a symbol of everything bad in this world. 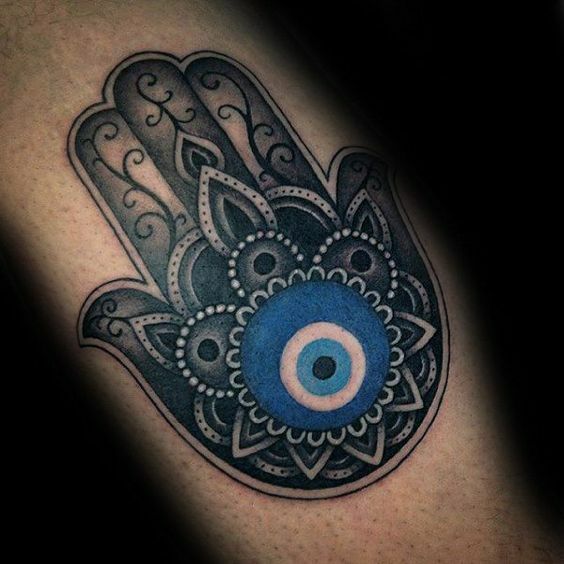 The modern Hamsa tattoo derives from this heritage and can be seen as a sign of protection, and a representation of good tidings and abundant blessings. If, however, you are only looking at it from an aesthetic point of view, it is no less significant. The tattoo is densely packed with detail, and every single line and curve is designed and placed inside the tattoo very meticulously. 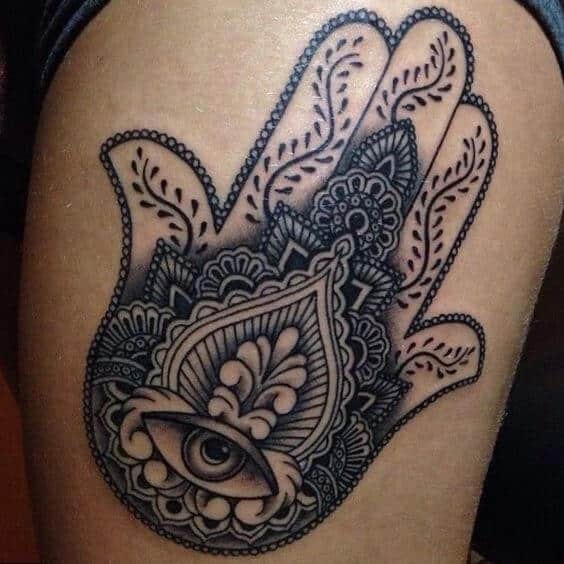 This gives a high artistic value to every iteration of the Hamsa tattoo. 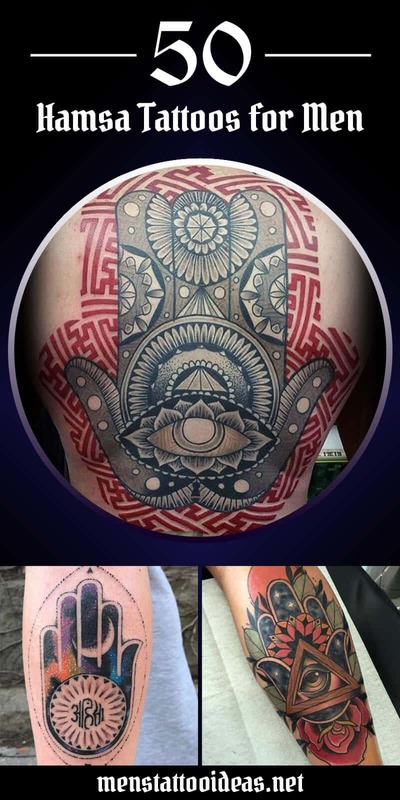 Hamsa tattoos for men are for anyone who loves Arabian artforms and wants a tattoo that has an incredibly rich backstory and is culturally significant. Still, that doesn’t make it any less appealing to someone who just wants a great looking tattoo too. 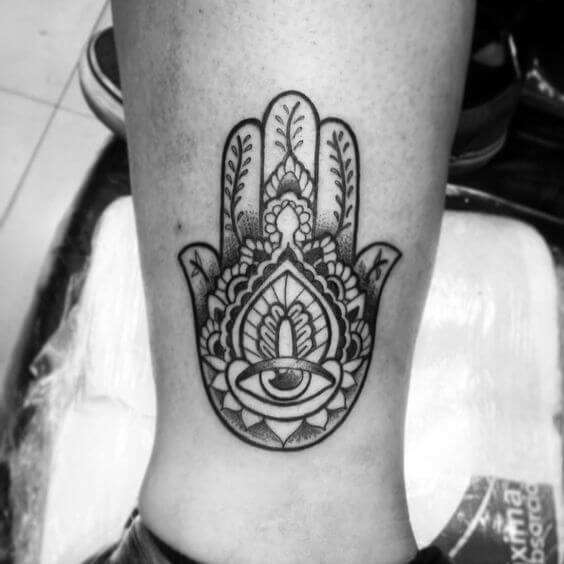 If you love complex patterns with a great sense of symmetry, you will absolutely love a Hamsa tattoo. 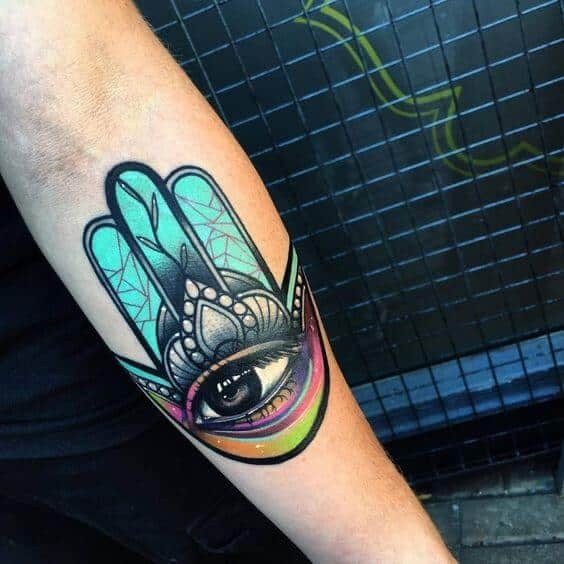 This colorful Hamsa tattoo is made up of a beautiful dark pattern surrounding a circular eye figure. The eye is a blend of black and blue colors and resembles the middle part of a flower rested within its petals and sepals making it unique. Its interpretation specifies one’s intention to reach tranquility and integrity in life. 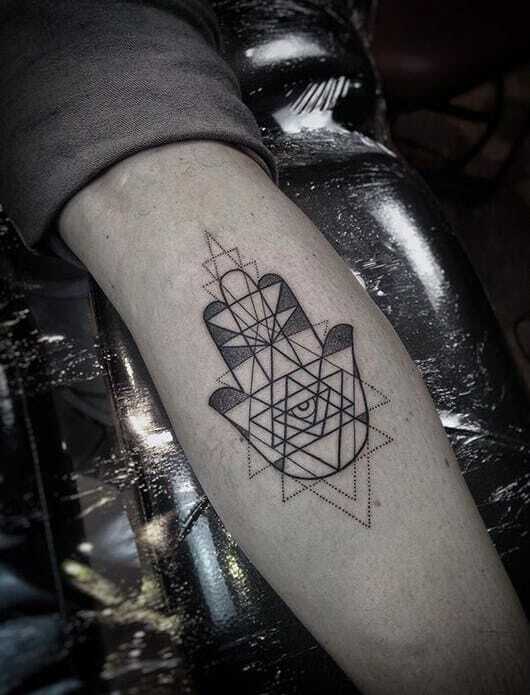 Perfectly designed piece of Hamsa tattoos for men in the form of a lotus. This tattoo appears as a real eye at the bottom of the flower of perfection. Its realistic eye design and outer design aim at one’s protection from any outward force by their sovereign being. This tattoo is inscribed on the back with surrounding red artistic drawings. The three middle fingers are uniquely equal in length with a big eye on the palm. It is a symbolic forceful amulet that is believed to shield an individual from unforeseen danger threats. 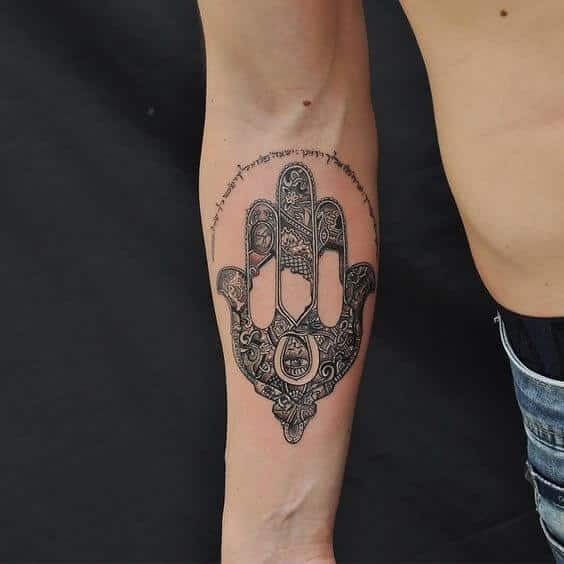 One of the great tattoo ideas for men that resemble an eye at the heart of a glowing flame, it is an art of the Islamic “hand of Fatima” decorated with wonderful black and white patterns encircling the flame. This is a sign of safety from any evil. A skeleton is mostly used as a warning from a no-go zone. 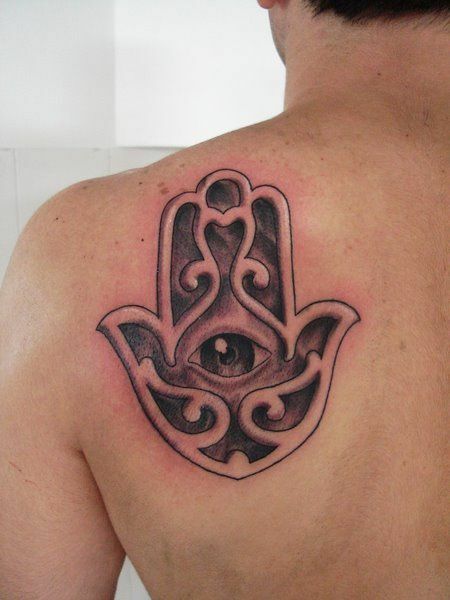 Nice Hamsa tattoos for guys that resemble a one-eyed skeleton engraved within a palm. The attractive black and white pattern makes it adorable while the skeleton symbolically warns enemies from intruding. The eye figure appears more realistic eye at the bottom of the palm with letter symbols on top is drawn on the inner forearm. The dull pattern around makes the eye and symbol more noticeable. It is believed to warn enemies that any moves they make are visible. 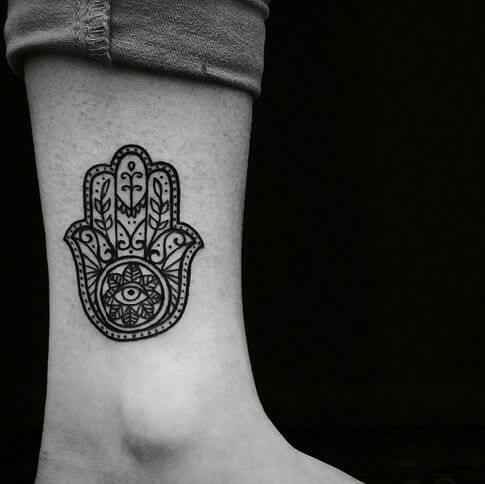 One of the many Hamsa tattoo ideas that’s small in size and placed on the back of the arm right above the elbow. Distinct ink is used to draw the candle flame that rests on a partially closed eye. The lower part is dark while lightly drawn compound leaf-like drawings extend to the fingers. It shows that the protective flame of an individual is still on in a precise way. 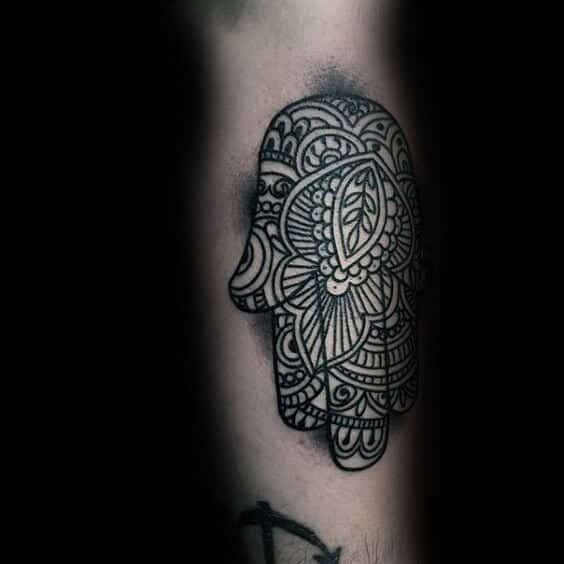 Hamsa tattoos idea on the leg is a man’s prerogative. It possesses a realistic representation of a protective eye within a circle. It is dark but the artistic patterns are still distinct. The small-sized hand figure is surrounded by a double-layered outer lining and drawn right above the ankle. 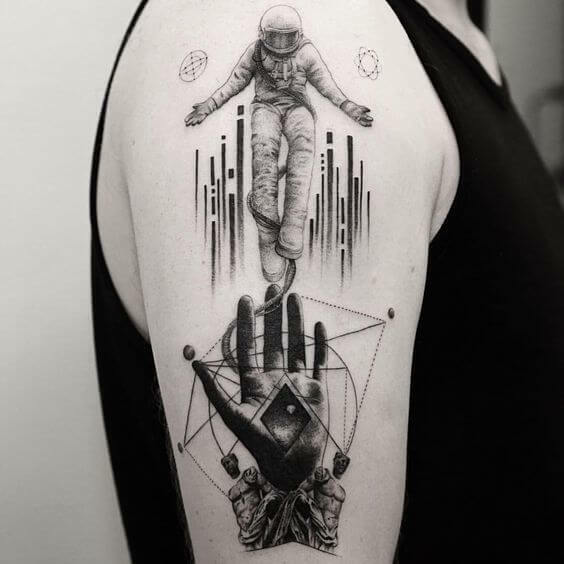 Yet another example of brilliant tattoos ideas on the front arm. 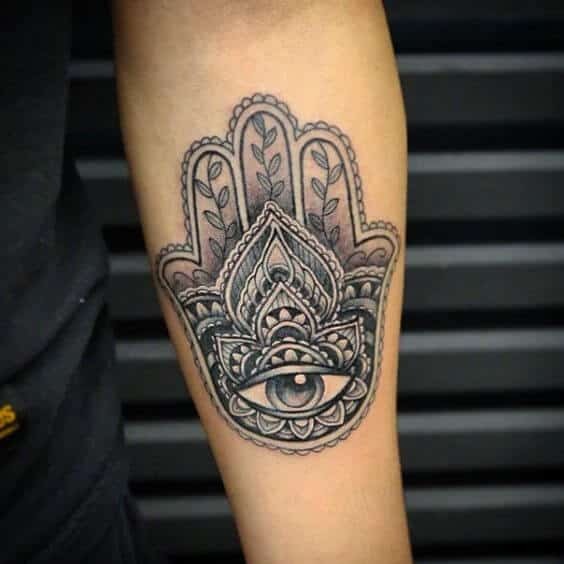 Huge in size with a smooth visible protective eye that lies below a dark floral pattern with distinct dot-like spots, this is a creative idea for a Hamsa tattoo on the front arm. Decorative but still manly, isn’t it? It appears like a well-drawn eye encircled in a dotted circle. The feature on top of the circle resembles a pair of ears. The small dots constituting the rest of the pattern make it attractive- excellent tattoo choice for the anterior forearm. Unique geometric design for men, it is made up of numerous triangles within a single palm. The innermost triangle at the middle part of the palm hosts the protective eye. Dark shadings on imperfect triangular shapes on both ends make it spectacular. 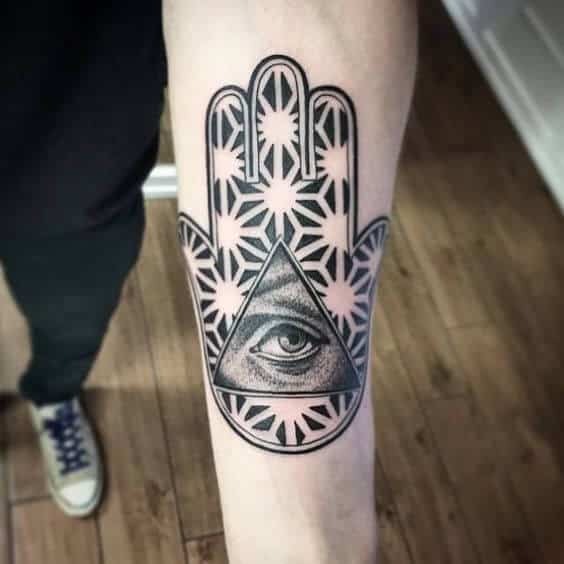 Another wonderful piece of geometry that creates a complicated Hamsa pattern, the shading has been made on one side of the palm figure cutting the eye along its vertical symmetry line. The right side of the palm appears real while the right side is more of a geometric drawing. Incredibly artistic and catchy to the eye, it also has real and geometric elements divided by the hand’s imaginary line of symmetry. The shading on the left side and the protective eye are much more innovative making them look like real pictures. 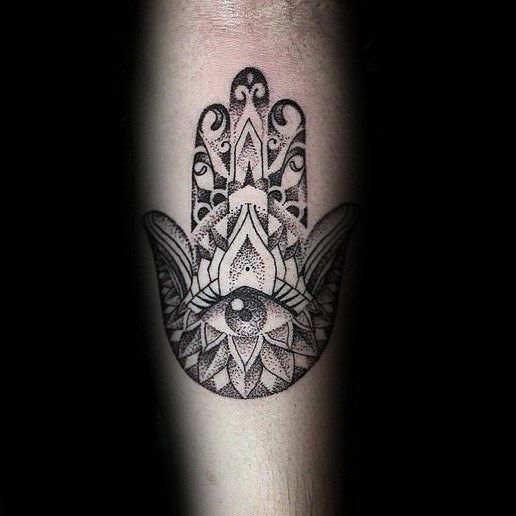 Medium-sized back Hamsa tattoo design that looks deep and concrete in the absence of any frills. The floral design and lower eye figure have patches of predominant black coloring. This enhances the actual meaning of the tattoo which symbolizes protection from misfortunes. Creativity at its peak! 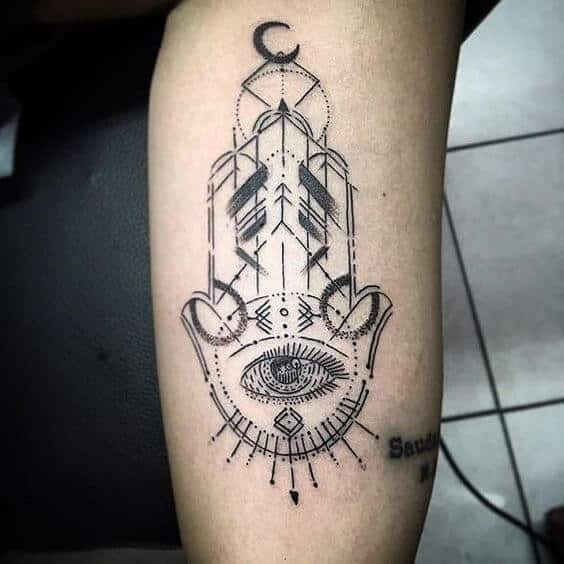 This tattoo appears like a being on top of the “hand of Fatima”. The hand is shaded distinctly to create the impression of a 3-D picture. The being seems to be held by the hand below. It symbolizes sovereign protection from evil forces. This fits well on the muscular part of the arm. Leaf-like tattoo with a black and white pattern that surrounds the hand figure to complete the leaf shape, the protective eye lies below a triangular-shaped drawing with smoothly-serrated edges. 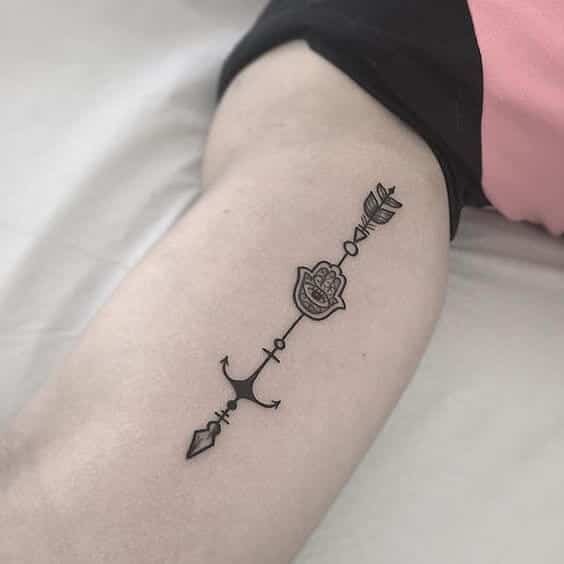 This is an ideal tattoo for the side-arm. A decorated palm characterized by a bold outline is an outstanding masterpiece of the tattoo art. It is drawn facing downwards making it unique. A figure of a human being lifting their hands occupies the middle part of the palm. It symbolizes a person praying for protection from a deity. A colorful blending of several color paintings defines this tattoo. The simple eye below a flame-like drawing is further enhanced by the mixture of colors that makes it more attractive. The bottom part resembles a mixture of poured out paint. A trendy concrete tattoo that presents a symbolic element engraved within a palm. The ink is dark and heavy making distinct boundaries. The protective eye is visible at the bottom part. Above the eye is a leaf-like drawing that decorates the palm. This tattoo is characterized by a wide middle finger whose base lies below its adjacent fingers. The protective eye is surrounded by sepal-like features. The whole tattoo is drawn lightly with colorless curvy lines running across the surface. 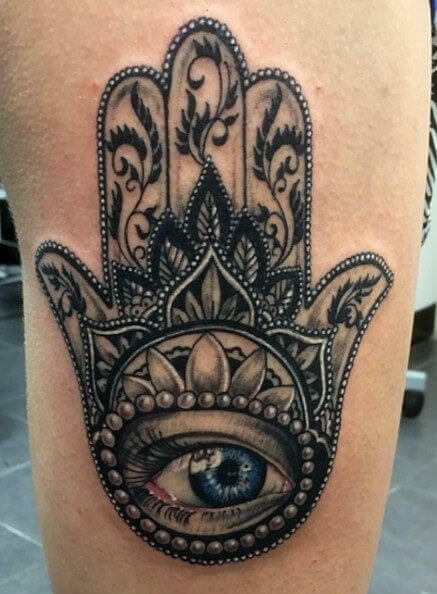 A blue-eyed tattoo that resembles the eye of a real human being on the bottom of a palm – the eye is surrounded by a bead-chain. The top part of the palm consists of an amazing pattern with many leaf-like features originating from the same bud. 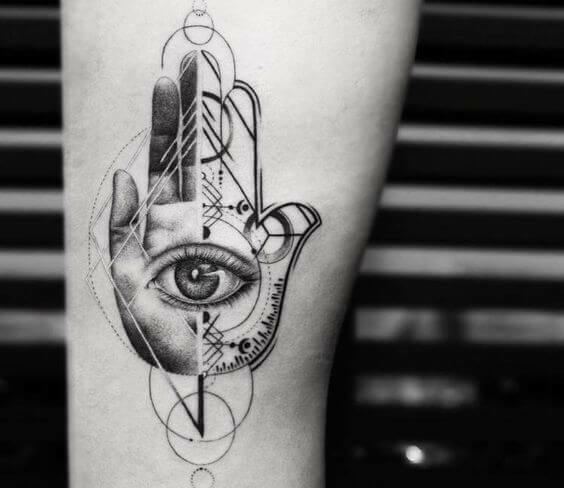 Another skeleton-like tattoo that lies below a human eye, a gate-like structure forms the background with grill-like demarcations marking fingers on the palm. It is a composition of ancient eye-catching designs stressed by the dark lines in the background. Wonderful tattoo with thin lines interlinked with a creative sense of art to form an impressive image. It has extending cross-like tips both at the top and bottom. 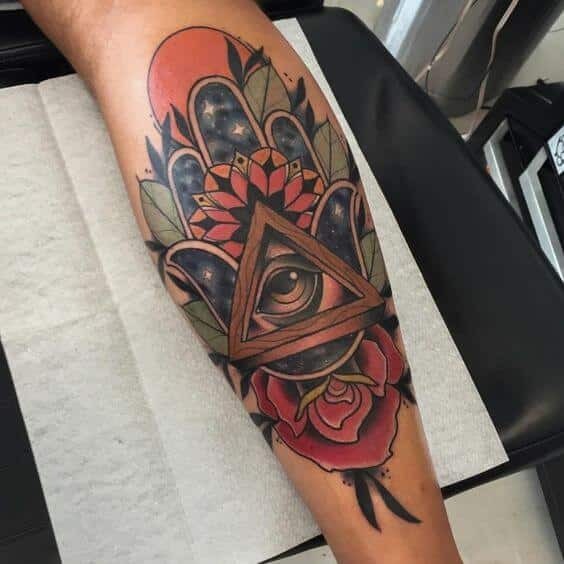 A flame is visible on top of the protective eye on the top segment of the tattoo. Perfect choice for the forearm! Smooth, perfectly drawn palm with a distinct dark pattern that envelope the big human eye in the middle section of a floral ornament. Attractive curly lines that resemble compound leaves extend upwards within the finger-like protrusions. In this tattoo, the palm has its fingers facing downwards. An impressive black and white pattern covers the whole palm. A leaf blade is visible at the heart of the “hand of Fatima”. The pattern combines symbols of various known oppositions, for instance, evil and good, black and white, to express the fact that the owner is searching for his own self and where he stands in life. 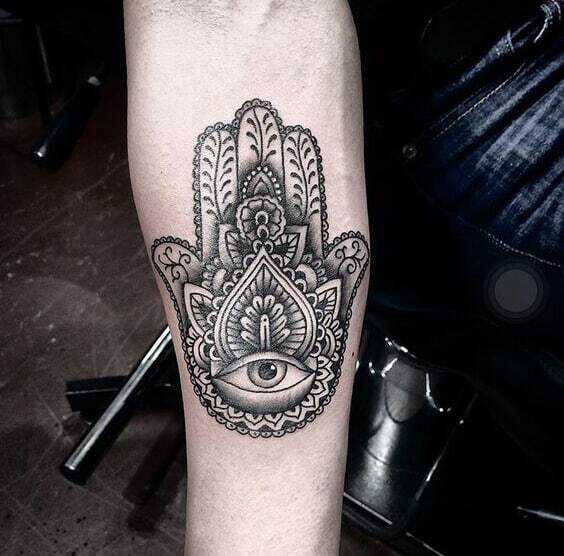 This aesthetically designed Hamsa palm tattoo looks Aztec. 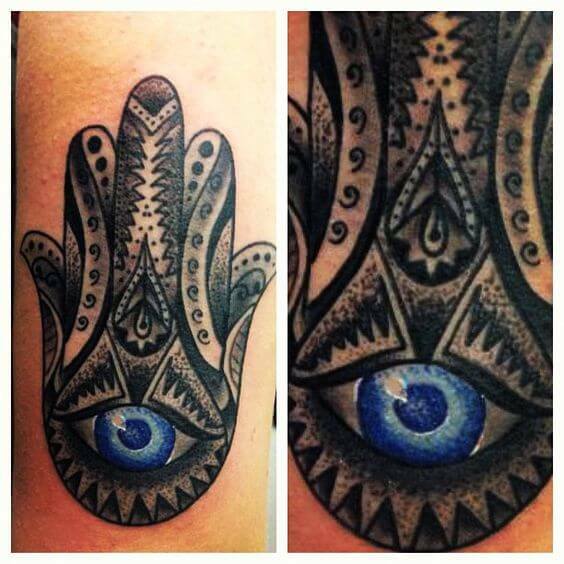 People get Hamsa tattoos primarily to ward off evil or attract good fortune. This Aztec-like pattern as we call it is particularly bold and ethnic. 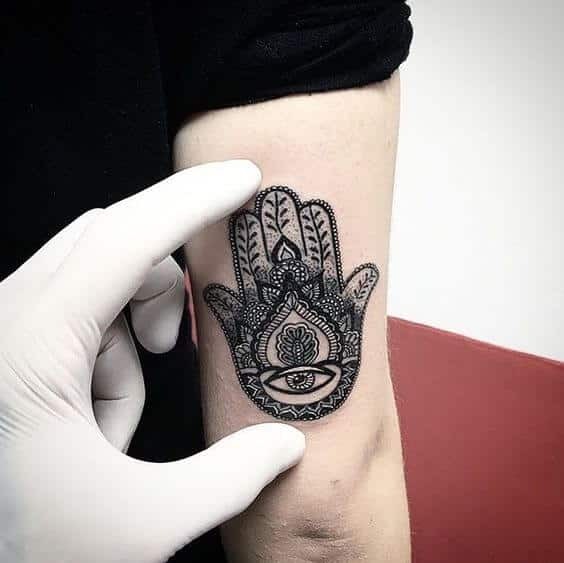 It is a traditional Hamsa design because that speaks of strong roots and is used as a talisman of sorts to fortify the wearer against people with bad vibes. This very beautiful and non-traditional Hamsa pattern is distinctly outlined. 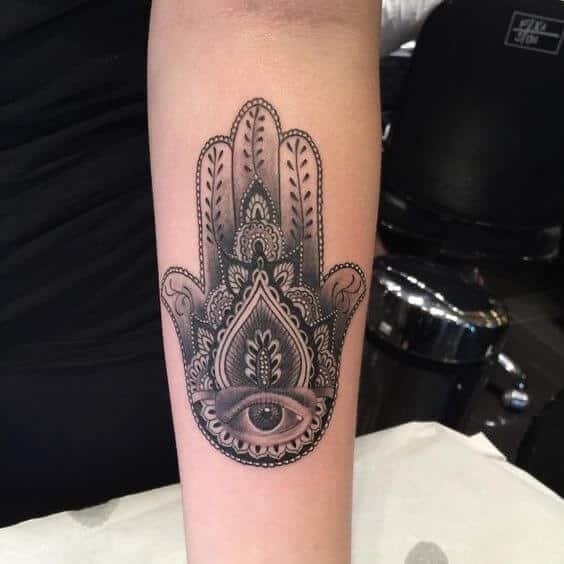 With images of leaves surrounding the eye and a delicate dotting style used on the palm, this Hamsa tattoo design reminds you of Mother Nature and all of her bountiful beauty. This Hamsa style is different and alien. It also uses a leaf and stem pattern. It is a very simplistic and masculine pattern. The eye of Horus stands out differently in this one. 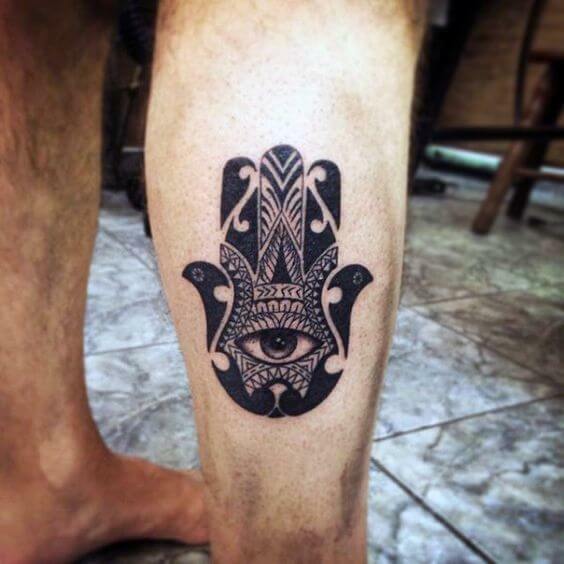 It is one of the cool Hamsa tattoos for men that send a message of strength. 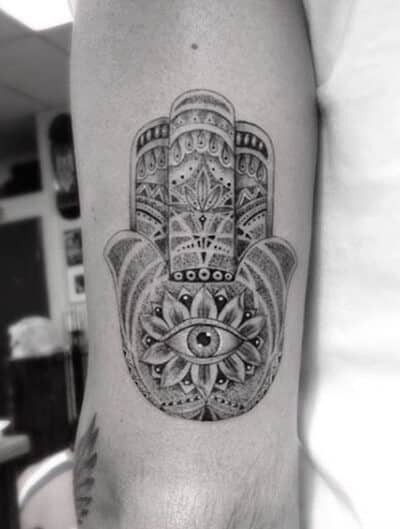 The artist and wearer of this Hamsa tattoo worked really hard to come up with a unique Hamsa style. The Hamsa hand is one among many talismans designed into an arrow. Very delicate in this layout, the hand strangely resembles a rose. 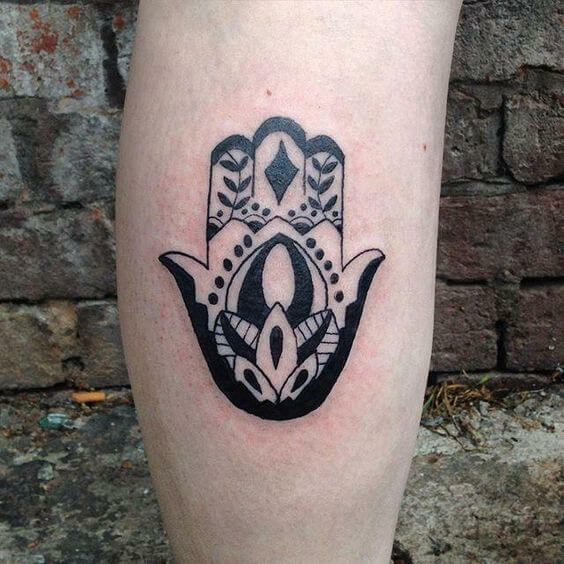 This design uses simple, bold lines to keep the fingers of this Hamsa tattoo together. It appears it was designed for religious purposes (probably to attract good luck) and adds a modern edge to the eye of Horus on the palm. 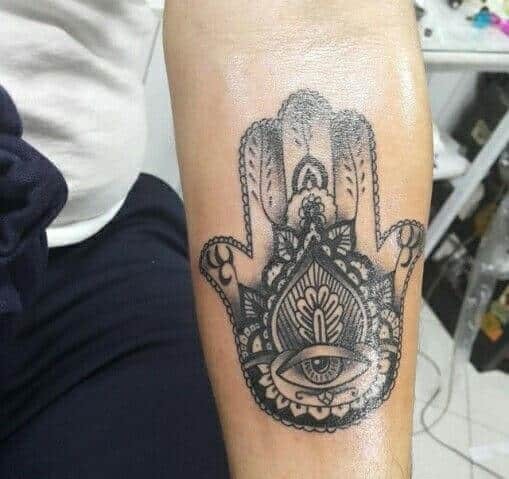 This Hamsa style is unique because it incorporates many symbols into a large design. 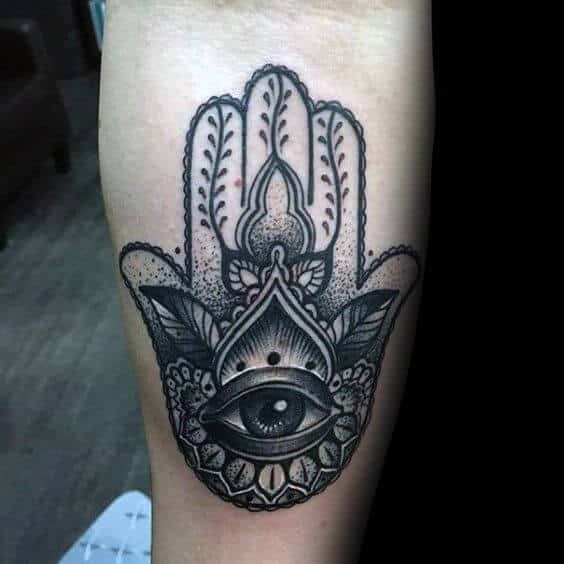 There are fish and what look like plants inked onto this Hamsa hand. Most times this means the wearer is a Christian who wishes to attract good fortune. A very different type of style is used here. The Hamsa hand looks like the fingers may be made out of tongues of fires surrounding an eye that has an eerily human quality. 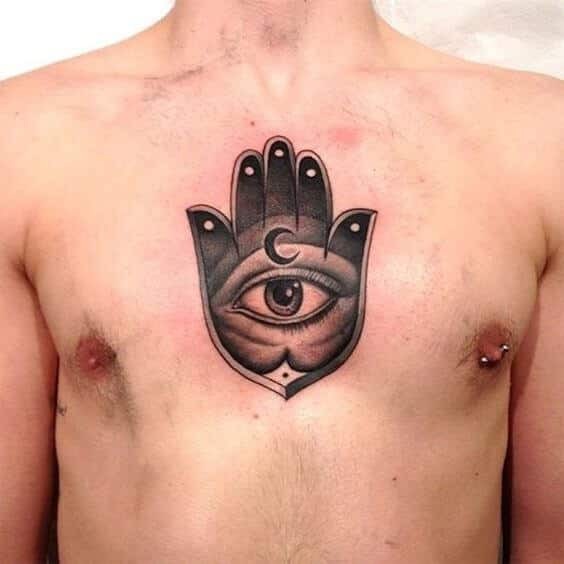 This creative tattoo is a cool choice for Hamsa tattoos for guys. 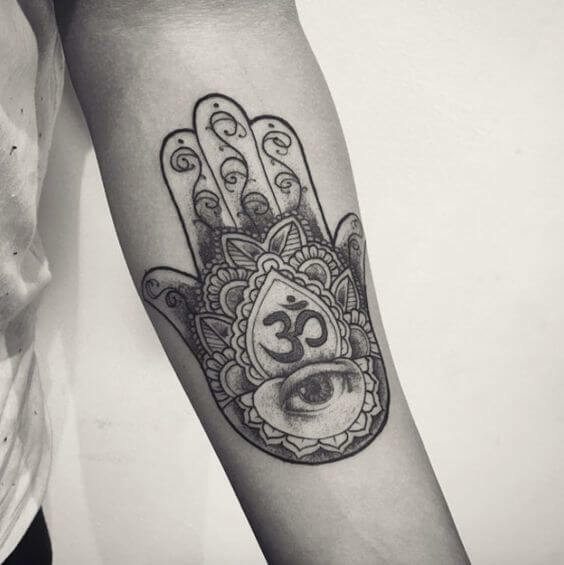 This Hamsa tattoo is designed as a religious mark. It has a crescent moon on it depicting Islam. The all- seeing-eye is skillfully etched onto a background of shades. It is also very meticulously designed because the impressive layout shows that the artist has a keen eye for details. 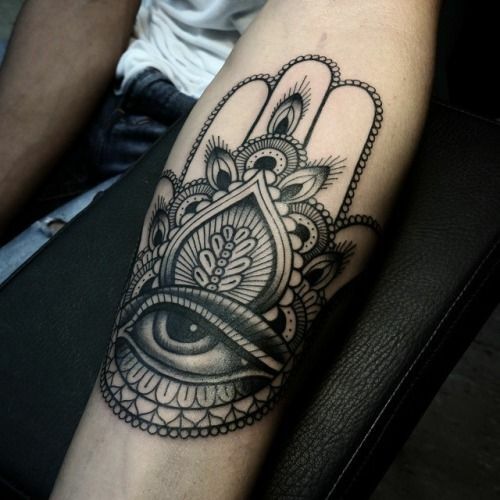 This is an intense Hamsa tattoo. The hand is designed to be quite dark but there is a startling blue eye in its palm. It is most definitely a unique design as most tattoists do not color the eye of Horus. It almost has a reptilian quality to it. 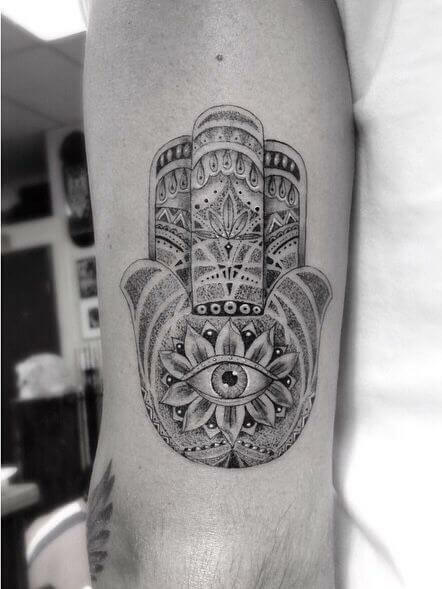 This is a very modern Hamsa design. It has many distinctive qualities and is not a traditional design. There are bursts of light designed across a network of triangular patterns. The eye of Horus is placed on a pyramid. 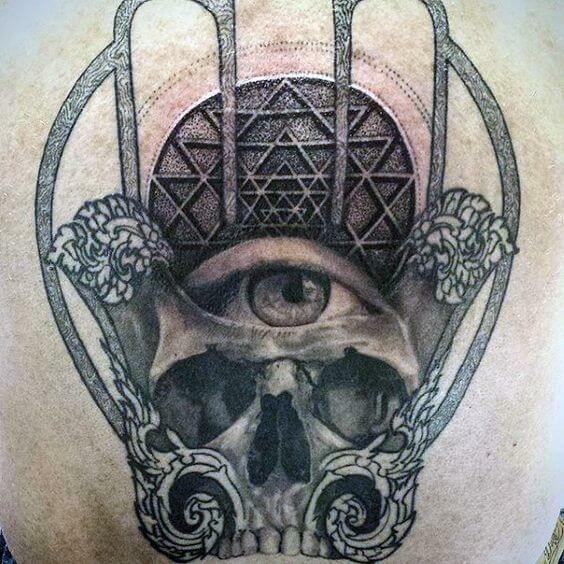 This Hamsa tattoo appears designed with the Illuminati in mind. This is a beautiful Hamsa pattern. It has leaves and petals. The design is ethnic looking and bears the eye of Horus seems to be enclosed in an unfolding leave pattern that looks a little like the Taj Mahal of India. Among hamso tattoo ideas, this looks exquisite. 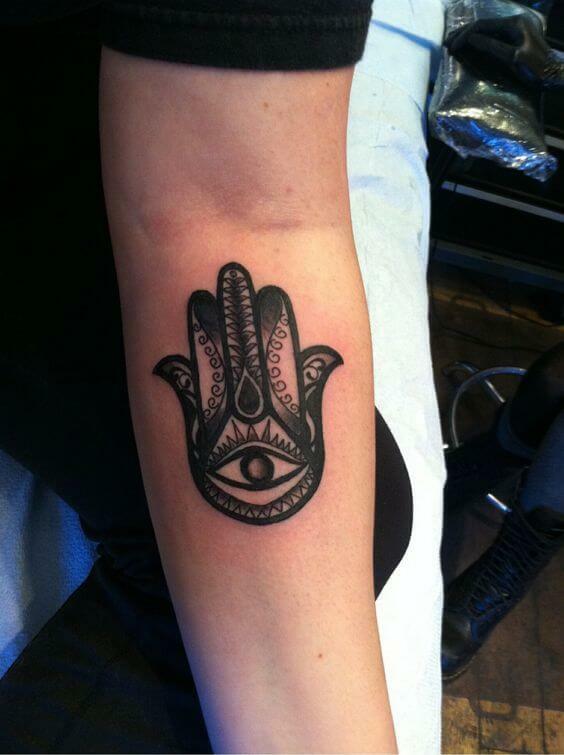 This Hamsa hand looks amazing. It looks like an ancient science model but has a crescent on the top which usually means the wearer has some Islamic religious vibes going on. The use of simple lines of different thicknesses gives this tattoo a distinct look. This tattoo is vintage Hamsa. It is surrounded by what looks like Arabic writing but also has fish on it which may be signifying a Piscean, a deep connection with the ocean, or a Christian. The eye of Horus is lost among all the other intricate designs. 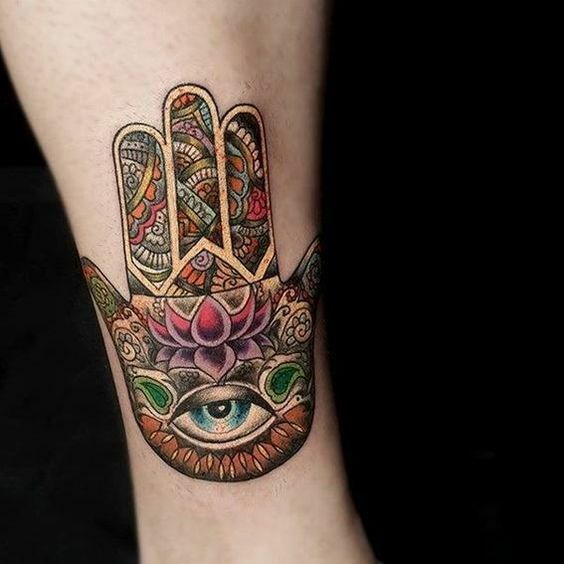 This Hamsa tattoo has a complicated concept. Like some of the others we’ve talked about, this one uses leaves and flowers. However, you can see the inner filaments of the flowers making for a complex design. 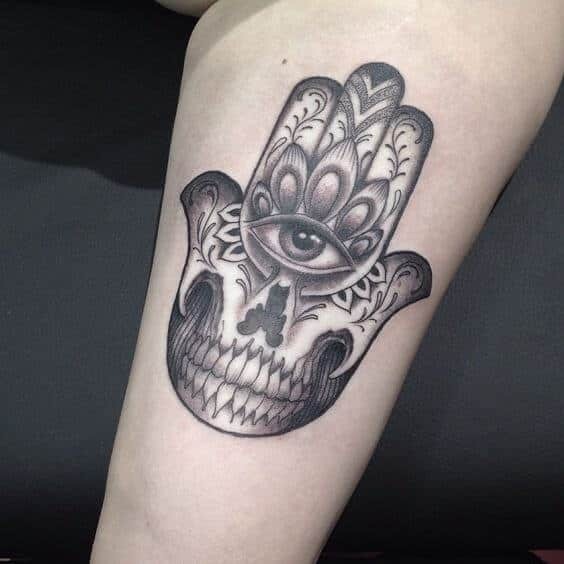 This is a good one among Hamsa tattoo ideas. 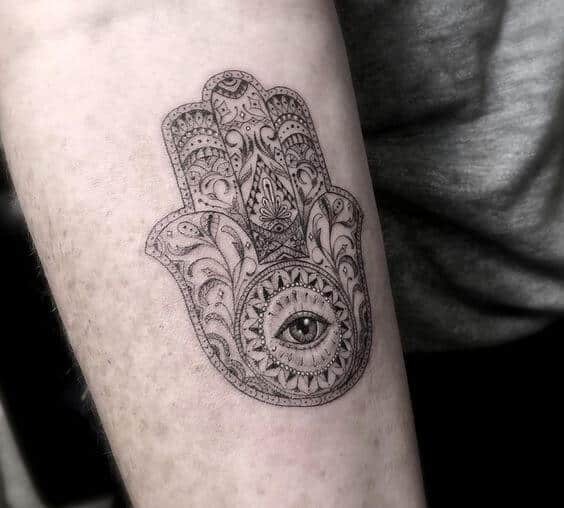 A smokey and hazy Hamsa styled tattoo. This theme makes for an exceptional and intricate design. This tattoo does not appear to be religiously affiliated instead it represents beauty and good will. The eye of Horus adds an almost humane quality to it. 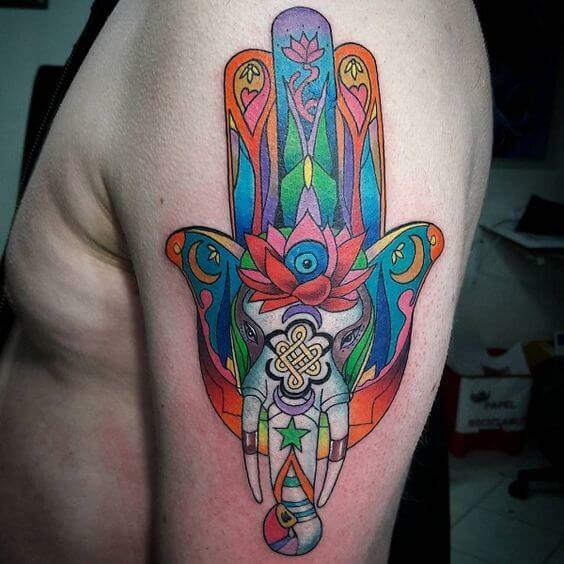 This trippy tattoo is an unusual Hamsa tattoos idea. This design uses a typical looking leaf and flower pattern but adds some outer strokes and symbols that add a psychedelic quality. 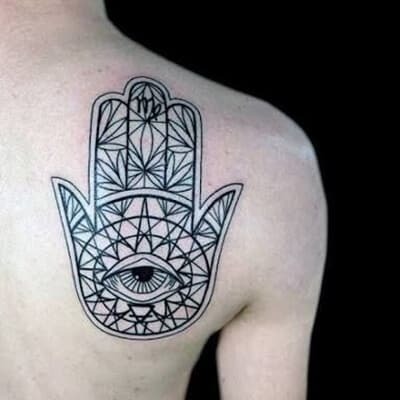 It is a cool Hamsa tattoo for men today. This design uses a closed hand to represent that the wearer wants to attract good luck. The finger digits are shaped like obelisks. The eye of Horus is centered on a bed of leaves. There is also a marijuana plant hidden in the design. 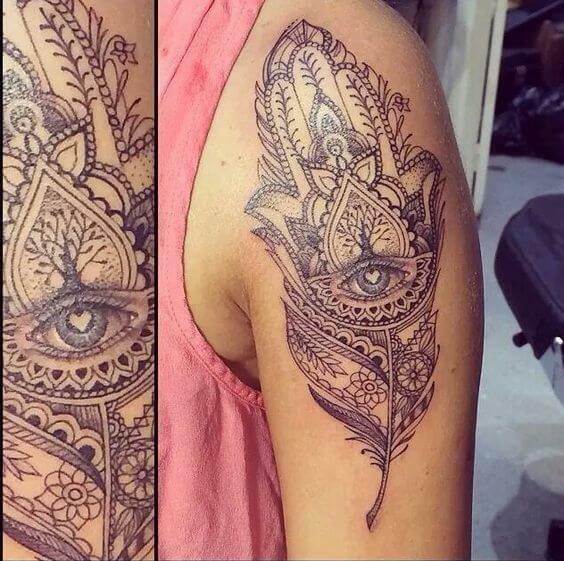 This is a very unusual pattern of the Hamsa tattoo. It clearly is very modern and has a personal touch. It utilizes neon like hues over buds of a plant that appears to be marijuana. The eye of Horus also seems a bit stoned. This is an incredible work of art. It is huge and multi-themed. The Hamsa hand sits on a bed of colorful roses and leaves. The hand is designed with and astral theme complete with stars and cosmic dust. The eye is surrounded by a triangular wood block. This is a very colorful and impressionable fusion of ideas and colors. The hand is designed so that it uses the head of an elephant as its body. The eye of Horus is actually centered in the elephant’s forehead. This could allude to the myth that elephants never forget. It is a transcendent design. 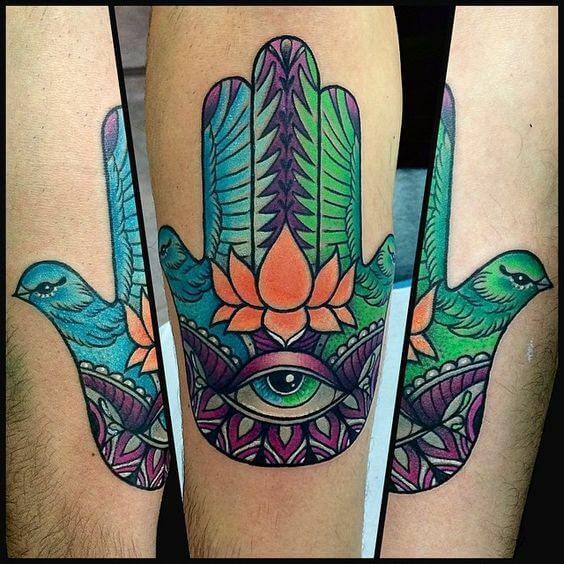 This amazing, avian themed Hamsa hand uses all the powers of creativity. The fingers are birds that look quite content which gives off the vibe of someone who is at peace with nature. 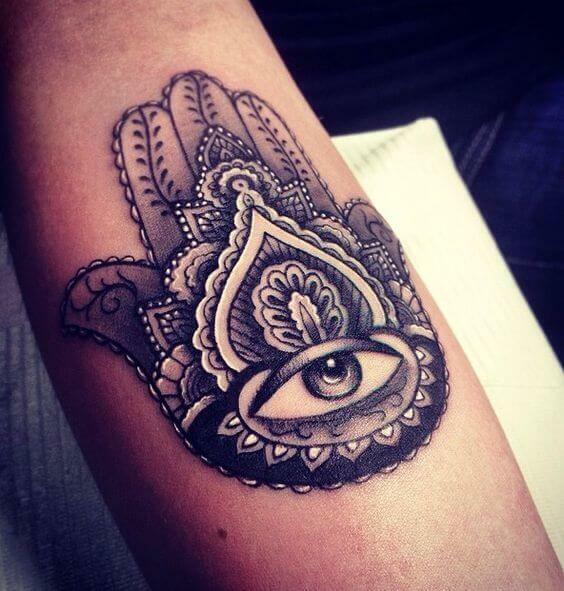 Among Hamsa tattoos ideas this is breathtaking. 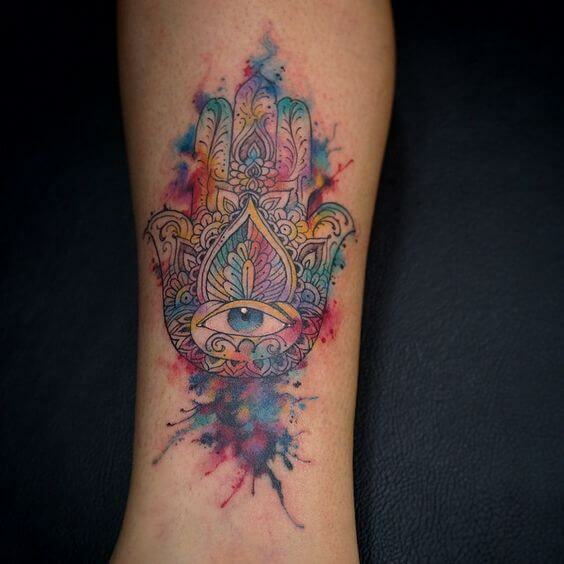 This is another ethnic Hamsa tattoo that makes amazing use of vibrant colors of contrasting and complementary hues. You cannot take your eyes of the intricacies of the wholesome layout. It uses leaves and is earthy. It does not seem religious. 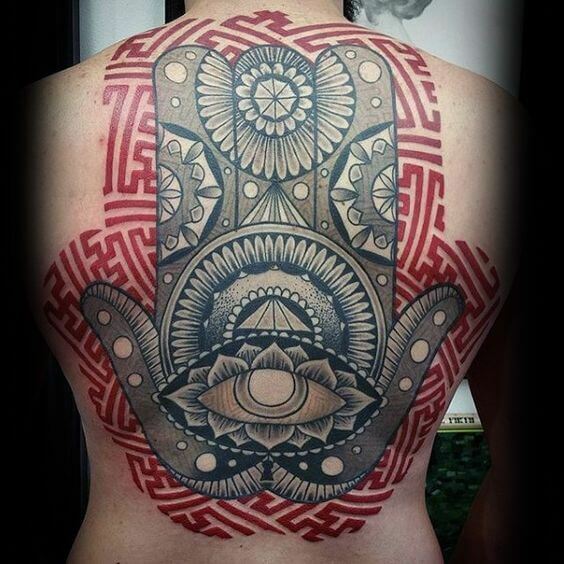 This massive Hamsa tattoo uses many symbols and strong themes. It is clearly talismanic and sentimental because it uses a cross with a loop on top which means eternal life. The hand is set on a background of what look like flames. It is very complex and detailed. This tattoo has a new age, fashionable vibe for the young tattoo lover. It uses interesting, sharp colors, a colored glass effect and rainbow hues. The eye of Horus is not designed to look piercing and shows the limitless creative license you can take with art. 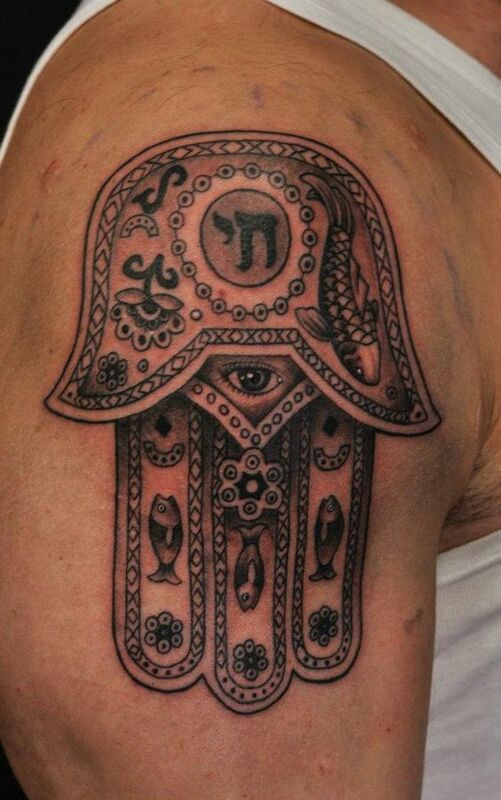 This is clearly one of those Hamsa tattoo ideas for men with an Islam theme. Truly impressive, it has a real crescent moon designed across the digits of the hand. The moon itself sits on a cosmic background and in place of the eye of Horus you see Arabic writing. This is very religious.